T-Priv Kits Blue and Purple in stock NOW all other colors will be available on Monday Very L..
Mag Baby Kit With TFV12 Baby Prince tank 4.5ml &nbs..
Majesty Kit Luxe Edition .. 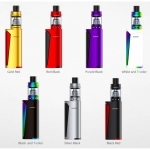 The SMOK AL85 Alien Baby 85W TC Starter Kit is the compact revolutionary system inspired from the..
SMOK Alien 220W TC Full Starter Kit ..
SMOK Alien 220W TC Full Starter Kit The SMOK Alien 220W TC Starter Kit is truly out of t..
SMOK G-Priv 220W Touch Screen Starter Kit .. Here comes the new member of G-Priv famil.. The SMOK G150 TC Starter Kit presents one of SMOKTech's incredibly advanced output technology wit.. The SMOK GX2/4 TFV8 Big Baby Beast Starter Kit is a two or four battery convertib..
H-PRIV 2 After years of arduous..
SMOK Helmet CLP Coils For Osub40w And Osub 80w (5 pack) .. When a mod comes with AI, what will happen? 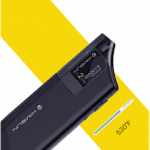 The new product I-Pr..
SMOK Infinix Replacement Pod Cartridge 3 pack ..
Majesty Resin Edition INTRODUCTION &nb..
OSUB Mini Kit is a pocket device consisting of OSUB Mini MOD and Helmet Nano tank. With included ..
Priv M17 comes with Priv M17 mod and Stick 17MM tank. This mod .. Product Introduction: The new SMOK Priv V8 Kit consists of a Priv V8 MOD and a TFV8 Baby.. The SMOK ProColor 225W TC Starter Kit is the latest masterpiece from SMOKTech's a.. The SMOK QBOX Kit is a stylish new, entry level vape setup from SMOK that is designed for vape be..
SMOK Rolo Badge All-in-One Replacement Cartridge..
SMOK Skyhook RDTA Box 220W Kit The SMO..
SMOK Species 230W with TFV8 Baby V2 Starter Kit The 2nd generation of th..
March 30 First Batch In USA Very Limited Supply In Stock ! SMOKTech is pr..
Smok Stick V8 Kit 3000mAh With Big Baby Tank SMOK Stick V8 Kit is the latest pen style vaping..
Smok 3Pcs Replacement Glass For TFV8 Tfv8 Baby Tfv8 Big Baby ..
SMOK TFV12 Baby Prince Acrylic 4.5ML Tube and Drip Tip Set The new acrylic drip tip has .. The TFV12 is the King of the Cloud Beasts. You thought the TFV8 was powerful, wait till you try t..
TFV12 Prince Cobra Edition tank, an unprecedentedly powerful and beau..
SMOK TFV12 Prince Cloud Beast Coil Head Replacem..
SMOK TFV12 Prince Sub Ohm Tank 8mL All PreOrder Ship Monday 11/6/2017 Limited Supply TFV1.. 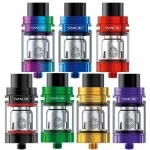 The SMOK TFV12 V12 Replacement Coils Pack brings the world class and industry leading coil ..
Smok TFV8 Baby Beast Tank 4 Colors Just Add 2 New Colors Blue and Gold ..
SMOK TFV8 Cloud Beast Sub Ohm Tank Custom Glass Poker Custom Designed - See Through Glas..
SMOK TFV8 Cloud Beast Sub Ohm Tank Custom Glass Skull Custom Designed - See Through Glas.. Product Introduction: Among TFV8 series with stylish bottom airflow system, SMOK TFV8 X-Baby ..
SMOK TFV8 X-Baby Coil Product Introduction: Here comes the SMOK TFV8 X-Baby Coil. The X-B.. Coil Ohm - 0.15 ohms Coil Material - Mesh Coil Build - Twelve.. Coil Ohm - 0.15 ohms Coil Material - Strip Coil Build - Twelv..
04.ohm rated for 40-80W, recommended 60-70W Coil Ohm - 0.4 ohms ..
5 PCS pack; Resistance: 0.15 ohm; Support 50~90W (Best for 60~80W); Suitable for SMOK TF..
V8 Baby-Mesh Fast Heating Process Massive Vapor 0.15Ω Coil 30-65/ Best 60-70..
V8 Baby-Q4 bring your denser vapor and purer flavor 0.4Ω quadruple Coil 30-6..
SMOK V8 Baby-T12 Brings you massive vapor and pure flavor 0.15Ω Coil 50-90/ ..
New Smok TFV8 Baby Beast T12 Coils! And they light up. Now you can trick out that TFV12 Baby Beas..
SMOK Vape Pen 22 Replacement Coils 5 Pack The..
Vape Pen 22 Light Edition is an advanced version of V.. Product introduction With 24.5mm diameter and 3000mAh capacity, pen style SMOK VAPE PEN ..
SMOK Vape Pen Strip Repla..
X-Priv Baby, small and subtle, glassy texture at front, cob..
X-Priv, a perfect combination of power and beauty. .. Smoke Stick V8 Kit 3000mAh With Big Baby Tank ..
SMOKtech OSUB Plus 80W TC Full Kit The..
SMOKtech OSUB Plus 80W TC Full Kit The SMOKtech OSUB Plus 80W TC Full Kit positions itself as..
SMOKtech Vape Pen 22 Starter Kit Vape Kits ..
INTRODUCTION Exquisite and powerful, here comes Stick Prince Baby! It consis..
TFV12 Baby Prince Tank &..
TFV8 BIG BABY LIGHT EDITION TFV8 Big Baby Light Edition tank is an advanced version of TFV8 B..
Smok TFV8 Baby Beast Tank ..
Smok TFV8 Baby Coils TFV8 Baby the new ..
Smok TF-CLP2 Clapton Replacement Coil he Smok..
SMOK TF-R2 Dual Coil RBA The SMOKtech TFR2 Re..
SMOK TFV8 Cloud Beast Tank Details ..
SMOK TFV8 Coil 3-PACK Cloud Beast GET ..
SMOK Koopor Plus 200W electronic cigarette VV / VW TC box mod ..
One Mini Box, Many Great Features SMOK X CUBE MINI is the mini ..
SMOKTech X Cube II 160W Box Mod Overview The SMOKTech X Cube 2 ..
Pyrex RSST Rebuildable Genesis Style The new version of the RSST is he..